Since 2011, The South Asian Studies Institute has had a ten year partnership with the Sikh Heritage Museum and National Historic Site and Gur Sikh Temple. The SASI, in partnership with the Reach Gallery Museum Abbotsford and the Khalsa Diwan Society, Abbotsford have curated and installed exhibit of varying degrees, highlighting Sikh migration history, art and culture. 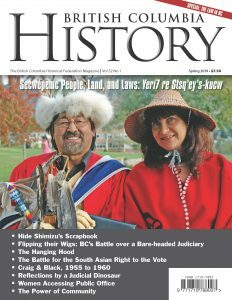 This work has not gone unnoticed as the the SASI is pleased to announce that it has been recognized by Heritage BC and will be receiving an Outstanding Award in the Education and Awareness Category for its exhibit on “(Dis)Enfranchisement: ” from Heritage BC. SASI Director Satwinder Kaur Bains and Coordinator Sharanjit Kaur Sandhra will be accepting the award at the annual Heritage BC conference taking place on May 10, 2019. 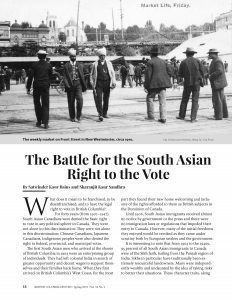 An article based on the SASI curated exhibit (Dis) Enfranchisement has also been featured in the BC Historical Federation magazine looking at the South Asian struggle for the right to Franchise. Tourism Abbotsford has also placed a prominent feature on the National Historic Site and Gur Sikh Temple as part of their Abbotsford promotions of things to do and see in town.